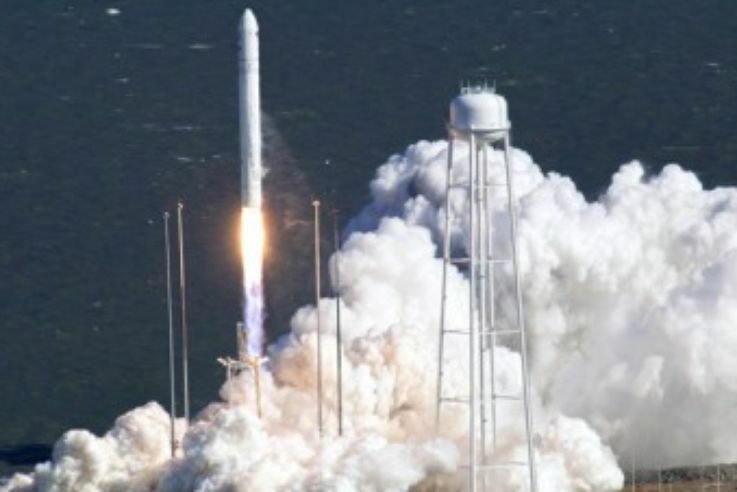 Weather permitting, the launch of Antares from Wallops Island, VA on October 16, 2016 will be widely visible along the East Coast. 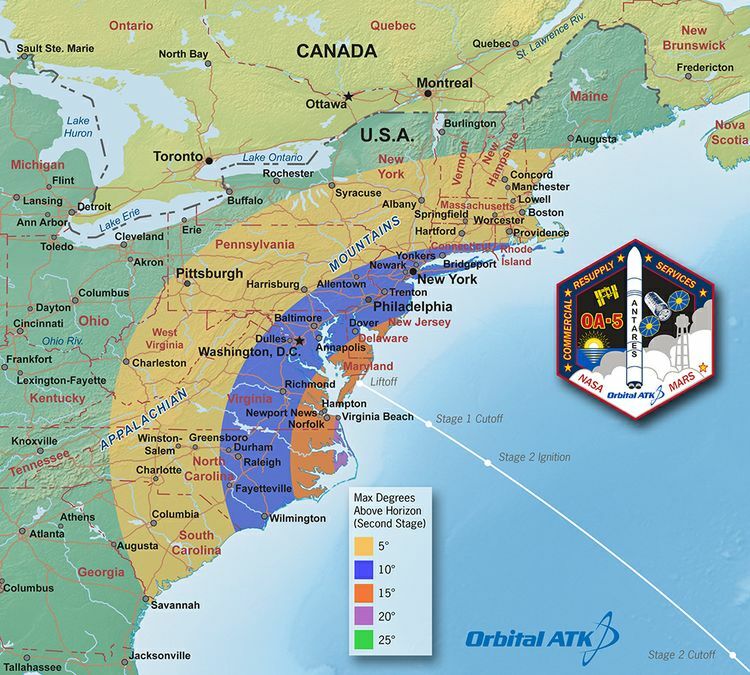 This map shows the rough time at which you can first expect to see Antares after it is launched. It represents the time at which the rocket will reach 5 degrees above the horizon and varies depending on your location. We have selected 5 degrees as it is unlikely that you'll be able to view the rocket when it is below 5 degrees due to buildings, vegetation, and other terrain features. However, depending on your local conditions the actual time you see the rocket may be earlier or later. 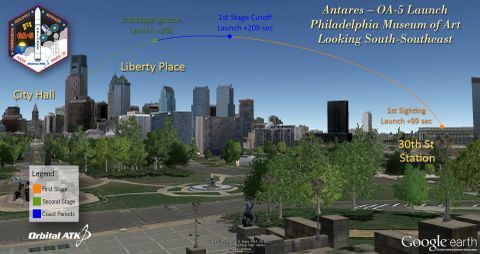 As an example, using this map when observing from Washington, DC shows that Antares will reach 5 degrees above the horizon approximately 105 seconds after launch (L + 105 sec). 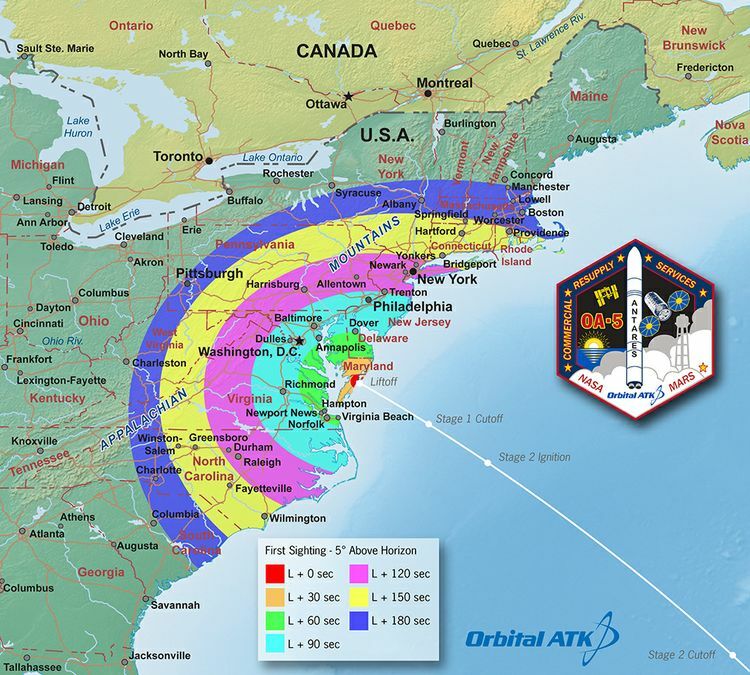 This map shows the maximum elevation (degrees above the horizon) that Antares will reach during its first stage burn. 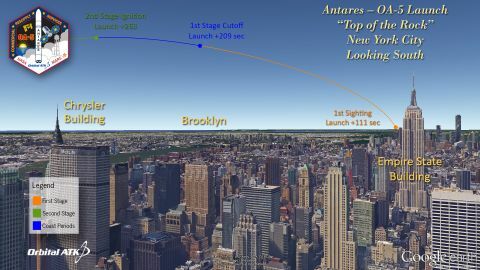 The maximum elevation depends on your location; the further away you are from the launch site, the closer to the horizon the rocket will be. As a reference, when you look at your fist with your arm fully outstretched, it spans approximately 10 degrees. 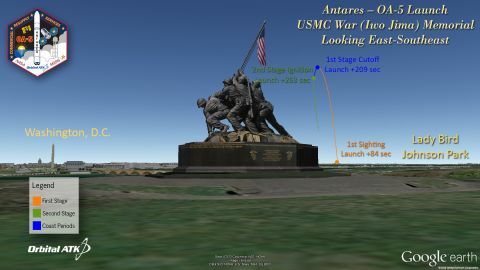 Thus if you are in Washington, DC the highest point Antares will reach is approximately 13 degrees above the horizon, or just slightly more than a fist's width. The contours shown stop below 5 degrees. It is unlikely that you'll be able to view the rocket when it is below 5 degrees due to buildings, vegetation, and other terrain features. The enhanced second stage in this Antares launch is ignited considerably sooner than in previous Antares launches. 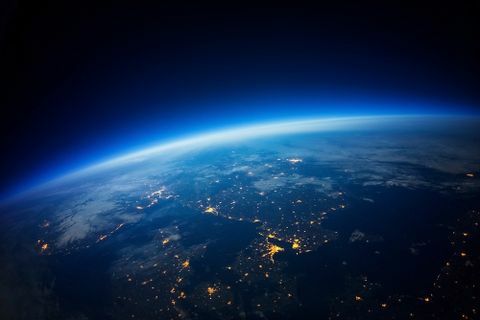 This means that the rocket will still be fairly high up over the horizon as viewed from most locations. 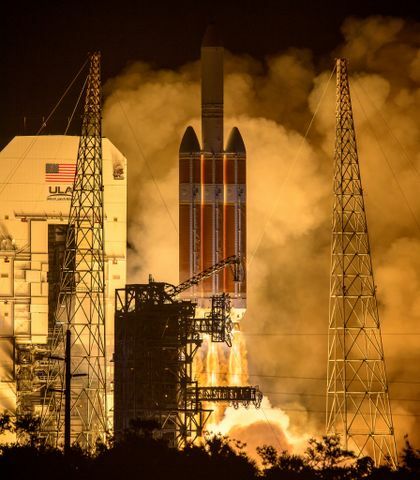 In addition the solid motor on the second stage is usually brighter than the liquid fuel engines of the first stage. 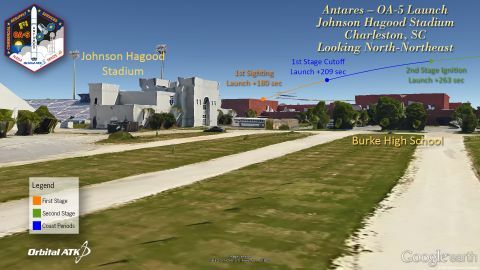 Even if you don’t see the first stage, it is possible you may be able to spot the second stage! You should also remember that there is a 54 second gap between the first and second stages; during this time the rocket will not be visible. 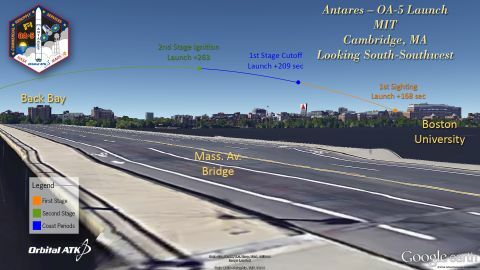 To facilitate you spotting the second stage, we have created a third map that shows the vehicles elevation (angle) over the horizon when the second stage lights up. We have created a variety of representative views from around the East Coast. 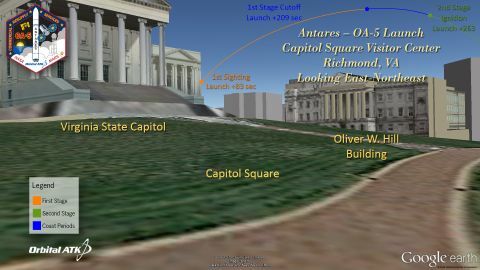 They illustrate the trajectory the rocket will appear to follow as viewed from various locations. 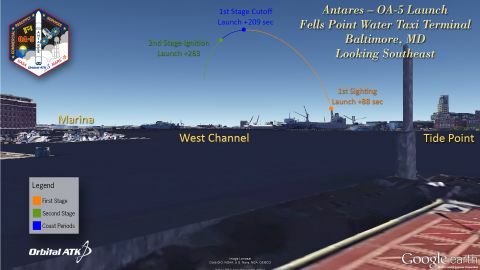 Note that there is a 54 second “coast period” between the first and second stages; during this time the rocket will not be visible. Be sure to wait until the second stage lights up. 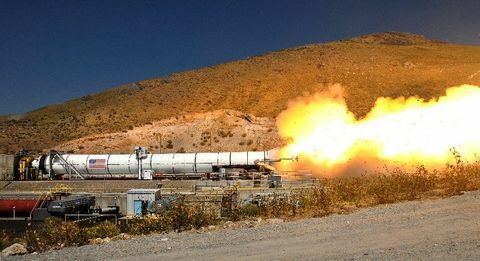 The second stage is a solid motor, and is usually much brighter than the first stage. You can create your own version of these views by using the Google Earth (.kmz) file below. Simply download the file to your computer, and open it on Google Earth. 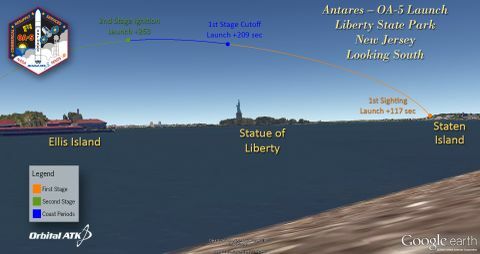 The file will display the rocket trajectory. You can then zoom in to the location of interest and change the view to point in the right direction. To get you started we have included in the file over 35 landmarks from New York to North Carolina.